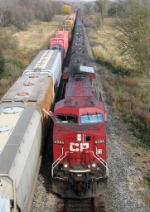 Description: CP Sulphur train with Mr. James at the throttle gives all of us a NICE wave!! Description: CP 250 waits in the siding for a meet with CP 168. Description: CP 9584 leads CP 250. Description: Just another CP #9500 brings train #288 into La Crosse this morning. Description: CP 8656 has just received a fresh crew, and is waiting for a green at Venice IL. Description: A solo photo of CP 9584 at Venice IL. Description: CP train #694 - Crude oil loads out of North Dakota. Description: A dirty GE leads loaded crude oil train #694. Description: CP 142 heads east out Nissouri. 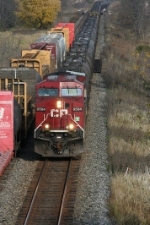 Title: CP 9584 east at Mile 72 Galt Sub. Description: CP 9558 West approaches Glen Tay with a pair of GEs running elephant style. Description: CP 9558 West appraoches Glen Tay Road and the former junction where CPs original mainline, the Havelock Sub, to Toronto once connected.